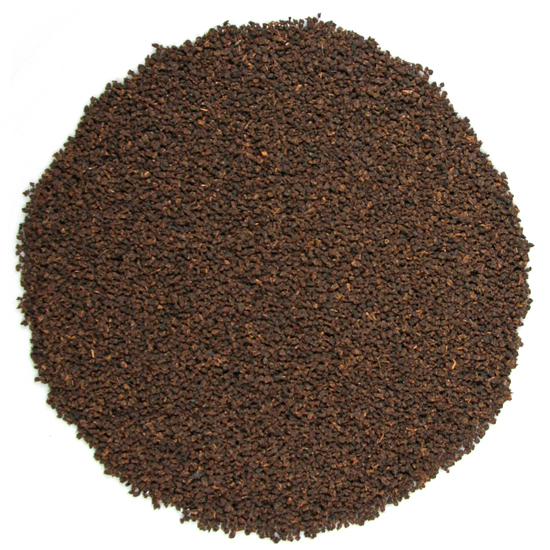 Because of the traditional particle size of this CTC, we tend to use a classic measure of this tea, but don’t hesitate to vary the measure for your own preference. We at Tea Trekker have been known to let this tea steep for a good long time (5-6 mins) to bring out some special deep flavors that otherwise might be missed, but this steeping style will not become astringent with this tea as it would for most other CTC-style Assam teas. Tea Trekker’s Kacharigaon Estate CTC Assam tea is definitely worth a long look and attentive tasting! This delicious CTC Assam is quite possibly the finest CTC-style Assam that we have ever offered (certainly true in the last decade). It has a wonderful depth of flavor from a long growing season. We tend to favor Assam tea from the 2nd Flush and Autumnal Flush because of the richness these teas have. It has a hearty, full-bodied style that Tea Trekker finds wonderfully satisfying. This ‘lot’ of Kacharigaon Assam tea has an expansive flavor that is quite intriguing. It has an earth-floor, woodsy, and toasty flavor.There is just a hint of smokiness in the aroma and background taste. For those who were fans of the Black Nuggets that we carried for years, this CTC tea is a bit different, in that it is a much more full-bodied and smooth alternative, and is softer than most CTC-style Assam teas. Our Kacharigaon Estate Assam is best when drunk plain, but milk or sweetener can be added, or spices added to create a masala chai, or it can be iced (this tea will cloud when cold). The better CTC-style Assam teas are perfect for many chai blends and also those who prefer a quick-steeping, strong black tea in the Irish Breakfast tradition. Because the better the leaf tea the better the cup of tea. The particle size of both of our current offerings in CTC-style Assam teas are excellent for chai due to their rapid steeping that matches well with the steep time for the spices. For those of you who make chai by steeping the tea leaf separately from the spices, then one of our orthodox Assam teas may be a better choice. Outstanding tea is grown in the Sonitpur region, on the northern banks of the Brahmaputra River, in the eastern-middle of Assam State in northeastern India. Unfortunately, quite a bit of really delicious Assam CTC tea is sold off too fast, too cheap, and is lost by being mixed in with cheaper tea in an effort to raise money quickly and to ensure selling whatever tea is produced, due to the incredible competition for CTC-style tea worldwide. The shelf life of this CTC manufacture tea is quite long and the steep time is best kept fairly short (2-3 minutes) making it perfect for chai blends that use fine-cut spices. We here at Tea Trekker are also known to steep this tea for 5-6 mins, and receive from that quite a hefty, concentrated tea. The particle size of this CTC is only slightly larger than that of our Kaziranga Estate Assam tea and is definitely smaller than the old ‘Black Nuggets’. It is a quite traditional particle size for a CTC-style.